Looking out on the end of the day as the sun sets on his life. 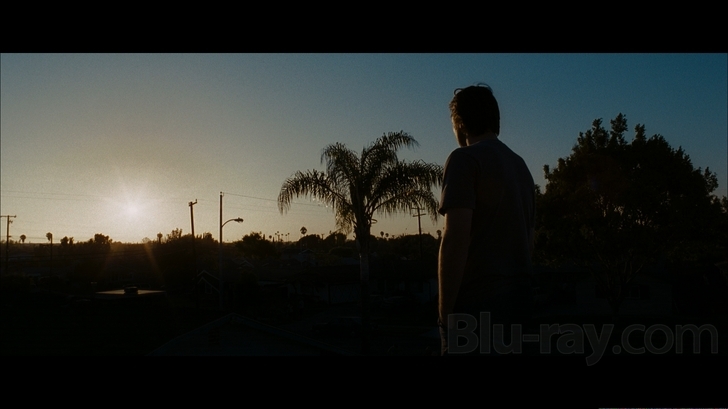 Henry Poole (Luke Wilson) buys a house at the full asking price on the street where he grew up in an anonymous Los Angeles suburb. Having received a terminal diagnosis for an undisclosed disease, he has come home to die. All he wants, is to be left in peace as he indulges in a diet of vodka, pizza and doughnuts awaiting the inevitable. When a 'stain' appears on the newly painted exterior of the house, his latino neighbour Esperanza (Adriana Barraza) sees the face of Christ in the stain and when a droplet of blood appears on the face, it becomes a shrine and site of pilgrimage. All of this deals a double blow to Henry, firstly to his desire to be left undisturbed and secondly to his, at best, sceptical view of faith and religion. I won't say anything more about the plot or narrative arc of this film but I will say for a mainstream film that is openly exploring issues of faith and belief, it does so with refreshing openness and engagement. It also offers clear psychological insights into the lives of the main characters, each of whom is dealing with their own set of circumstances. The actors performances add to the believability of the characters and each one allows the viewer to explore how they might react were they stand in their shoes. The central questions in the film relate to faith and doubt and whether something you don't believe in can exist outside of your beliefs. Other questions to explore might be, are doubt and certainty opposite ends of the same continuum? Also, does belief look the same for everybody? Henry placed his faith in medical science without any evidence whereas Esperanza placed her faith in a likeness of Jesus that was tangible. Whose faith was blind? The pace of this film is deliberate and gives space and time for the characters to wrestle with what's before them. It is a film about kindness and giving. It is also a film about virtue - faith is foremost and Esperanza means hope, in his other neighbour Dawn (Radha Mitchell), he may find love and at the grocery store he encounters patience! Dawn certainly lives up to her name in guiding Henry through a series of epiphanies. This is a gentle and heart-warming film about important things which delivers its story in a realistic and engaging way. I encourage you to check it out and reflect on what issues it raises in your mind. I'll give it 7/10.